Great racket technique is not going to win you games if your court coverage is poor. Every shot requires quick thinking, sometimes anticipation, in order to get in position to make the shot. And once you’re there, your body has got to shape up for the shot correctly, otherwise the results are just not going to come. As an experiment, take a quarter of an hour to walk out on court without a racket and think things through mentally. How familiar are you with all the angles? How quick can you make it from the baseline to the net, or across court. What about your squash fitness? How’s that movement from the back to the middle of court?You’ll quickly see how much of racket sport performance is a result of fitness and good body technique. Let’s start with your footwork. Half-steps, hops, half and full shuffles. These can make all the difference between a great shot and a poor one because the purpose of them is to get your body in the right position. Hitting the ball when on the run is a difficult skill in itself, so it is vital that even when travelling a full speed your body remains well balanced and able to move into the ball in order to get your racket around it. Always aim to stay on your toes to keep your reaction time down to a minimum. 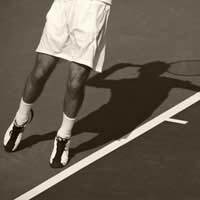 If, on the other hand, you are on your heels or flat footed, you are going to find it very difficult to buy yourself the half-second needed that can be the difference between hitting an effective return and finding the net or watching the ball or shuttlecock fly by and the point disappear into your opponent’s pocket. Of course balance and posture influence footwork because staying loose and flexible in your upper body is going to have a great deal of influence on how effectively your feet operate. So when recovering from the last shot and awaiting your opponent’s next move, return as quickly as possible to a position where the weight is evenly distributed over both feet so the body can go either way at a moment’s notice. In terms of posture, keep your head up and your shoulders square so that your body is nice and open. A closed stance and a head buried into the shoulders is going to make it all the more difficult to move quickly and efficiently into a shot-making position. This body discipline will be aided by keeping a cool head and staying sharp. Naturally, you don’t want to be too loose but if your upper body is tight, you won’t be well balanced and your racket arm will start working against rather than for you. Allow yourself time before every match to mentally relax, perhaps during your warm up. Think of your body in the same way you would the strings on your racket. Too little or too much tension is going to throw your entire game out of balance. But get it right and everything else will flow from there.